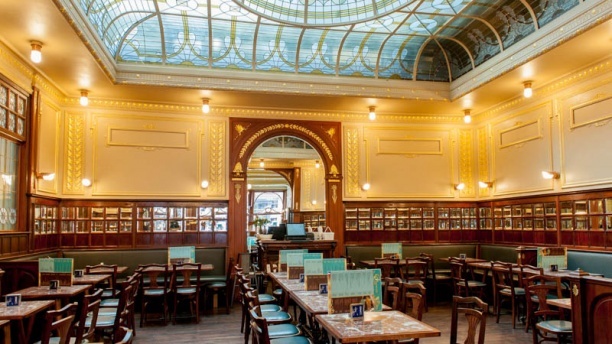 UNMISSABLE AND TIMELESS, the GREENWICH CAFÉ has been part of the Brussels landscape for a long time. TYPICAL DISHES of brasserie cuisine await you at this delightful location on the rue des Cartreux at 1000 Brussels. YOU WILL ALWAYS FIND SERVICE WITH A SMILE and very satisfied customers at the Greenwich Café! A place to go to for the history and atmosphere. Robust cooking, nothing fancy. Attentive service. Reasonable prices. Would go again. As I already stated on other websites this is one of my favorite places. I’ve been to Greenwich Cafè several times and I’ve never been disappointed. Food is very good, the location is awesome and the service is quick and kind. All in all I think this is an excellent place to have a meal at. Great ambiance lovely staff! Really loved the old railway station feeling the place gave me. Staff spoke English wel. Food was served quick. Excellent Belgium beers available. Fria a temperatura no restaurante. Quanto ao resto gostámos muito. Vamos regularmente a este restaurante. Tipicamente Belga. Excellent service, delicious food and perfect timing. Nice service, nice food and nice place. A bit pricey but the quality was great. Wouldnt hesitate to come back! Quiet atmosphere and beautiful decor. The Lapin à la Kriek was very tasty. Good musels near of the Center of Brussels. In this restaurant is very interesting prices with promotion. Nice lifely restaurant. Nearly fully booked when we arrived. Food was good, the best was the desert. Long waiting time for the main dish. However, when we enquired regarding the offer, we were told that in order to partake this -30% off the ala carte menu, each one of us have to order a full course of lunch. Not a big eater ourselves, we wasted quite much food. Each one of us have had to order a starter, a main course, dessert, to tea/coffee. This condition should have made known to us earlier, prior to making the reservation..
Good food but waiters and employers have been so so rude. We had a reservation through TheFork, but the personnel said us we had to order at least 2 dishes if we wanted to use the discount booked. The management has been uncorrect about the conditions mentioned on the app. Charming restaurant in centre of Brussels. Offer with thefork really interesting as dishes are generous and good. We had croquettes (cheese for me, shrimps for my husband) and mussels...both very good, although I thought the moules à la marinière were a bit too citrussy for me. Service quick, efficient and friendly. Nice food in wonderful surroundings. If you go to this restaurant, you definetly try toasts. It was a good eating experience food us ??????? ?